Before sharing student information with families, please be sure to review the Guidelines for Promoting AFS Students. Thank you! Short bios are available on the www.afsusa.org website as a way to give the general public a brief introduction to our students. This feature is often referred to as Meet the Students. Finding students this way only gives very basic information and does not include important facts that are useful when matching a student and a family. For example, a student's pet allergies or dietary restrictions are not obvious on Meet the Students. Thus, it is important to be able to find more detailed student information when talking to interested host families. In addition, there are sometimes more students available to a family than the number showing on the website. When you get to the Placements screen, you will see the following list of filters at the top. Simply click on the box you want to filter by and the available students that meet that criteria will appear. 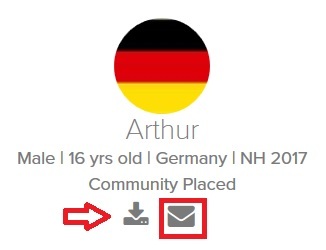 Clicking on “My Team” will only show you students currently Community Placed, School Placed, or on Hold in your Team while clicking “All Available” will also show any Nationally and Regionally Available or Area Team Hold students eligible to be placed in your team. “About Students” is the filter you would use to look for students with certain hobbies, activities, religious affiliations, and/or interests (guitar player, fencing, or Buddhist, for example). To reset the filters, click “Clear Filters” to go back to the default. To find more information about our students in Global Link, please check out the handy guides below. You may not have access to the Hosted Participant Section of Global Link if you do not have the correct affiliation and/or training (Department of State Certification and Hosting & Support Affiliations Training). Please contact your TDS if you need access or have any difficulty finding the information you seek.